SPOILER ALERT!!! SPOILER ALERT!!! READ FURTHER AT YOUR OWN PERIL!!! WHAT AN EPISODE!!!! From the lightsaber duel at the beginning, to our heroes’ return to the Jedi temple on Lothal, to the arrival of Darth Vader at the end of the show – WHOO!! This episode was great!!! I am going to begin this review in reverse, readers. Please bear with me. 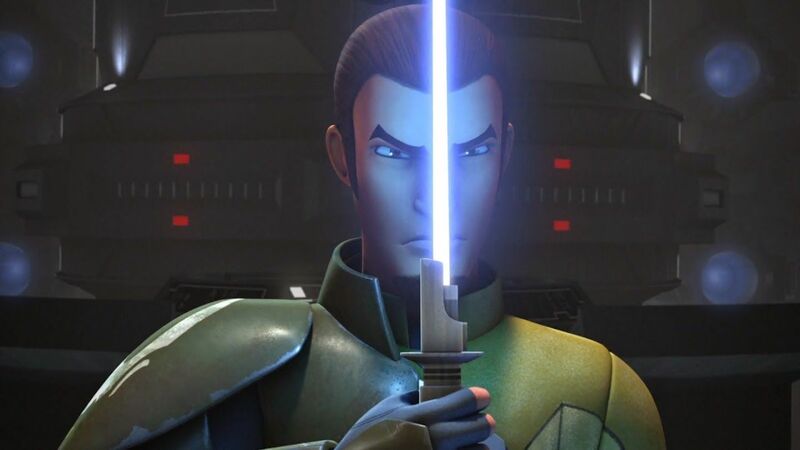 Kanan’s vision trial in the Lothal temple is the talk of the Internet – among other features of the episode. Searching for a way to defeat Vader and the Imperial Inquisitors, Kanan faces off against a Temple Guard (from the main Jedi Temple on Coruscant) in his vision. The Sentinel warns him that he cannot protect Ezra forever, and that if he tries to fight, he will die and the boy will fall to the Dark Side. He and Kanan end up in a duel, which ends when Kanan admits the Sentinel is right: he cannot protect Ezra from everything, least of all can he protect Ezra against himself. He can only do what he has done – train Ezra as best he could. 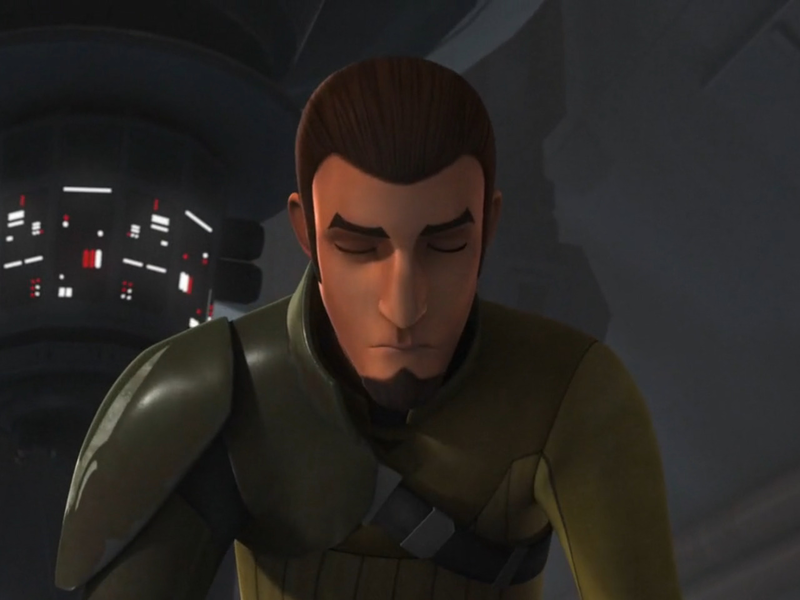 Bowing his head, Kanan clearly expects to be struck down…. Instead, the vision Sentinel knights him! If this news was not enough of a surprise, Kanan gets a second shock when the guard removes his ceremonial mask/helmet – to reveal the face of the Grand Inquisitor, the Dark Side Adept who was hunting him and Ezra in Rebels’ first season! This scene is flabbergasting. The last time we saw the Grand Inquisitor, he was falling into an exploding reactor core. How in the galaxy did his spirit end up helping Kanan on a vision quest in a Jedi temple?!? He was a Dark Side Adept, one of the bad guys! Well, according to the Grand Inquisitor’s own admission, he did not start out as a Dark Side user. He started life as a Jedi, specifically a Knight – and considering his ceremonial garb and lightsabers in this episode, it seems safe to think he was originally a Sentinel Jedi, one who took time to play Temple Guard at some point. This would explain why he and the other Inquisitors use double-bladed lightsabers. If the Grand Inquisitor was a fallen Sentinel Jedi, then it makes sense that he would train the rest of the Inquisitors in the lightsaber skills he was accustomed to using. And double-bladed lightsabers are very effective weapons! A lot of viewers who saw Shroud of Darkness are a bit puzzled by the Grand Inquisitor’s appearance as a Sentinel spirit in Lothal’s Jedi temple. We knew that after falling to his death in the reactor core in Fire Across the Galaxy last season, he had become one with the Force. But most of us figured he had become one with the Dark Side. Now, we know he became one with the Light-side of the Force! This leads us to an interesting question: How did he pull that trick off? I have been racking my brain since viewing the episode, trying to remember the details of the Grand Inquisitor’s death from the final show of season one. From what I can remember, Kanan could have killed the guy while he was clinging to the catwalk. As a Jedi, of course, Kanan was not going to do that. However, I seem to recall that I could not place the expression on the Grand Inquisitor’s face. He looked afraid, yes – who would not be in that situation? There just seemed to be more to it. Watching that scene several times since season one’s conclusion (the lightsaber duel really was amazing! ), I got the impression that there was more to what the Grand Inquisitor was feeling than met the eye. It has bothered me ever since, on and off. For a start, there seemed to be some remorse in the Grand Inquisitor’s features, as if he was sorry for wasting his life in service to the Empire. And what Dark Side Adept would so politely – almost sadly –state that Kanan and his apprentice were in for a harder time of it, now that they had defeated him, blown up Governor Tarkin’s Star Destroyer, and sent a message that would ignite a galaxy-wide rebellion against the Sith Emperor? That speech seemed especially out of place. It would hardly have been surprising if the Pau’an had cursed Kanan and the other rebels, sneering that they were now in for more trouble than they could possibly imagine. Instead, he seemed almost sorry that they were going to face worse odds in the future. Now I know why I felt that. Somewhere on his way down the reactor core – heck, maybe before he had even let go of the catwalk – the Grand Inquisitor returned to the Jedi path. It is the only explanation that logically answers why he was able to test Kanan in the Lothal temple. No Dark Side user – whether they were flesh or spirit – could hope to enter a Jedi temple without having a nasty greeting waiting for them. Fifth Brother and Seventh Sister found that out the hard way. From what I remember of the Star Wars novels (now non-canon “Legends”), anyone entering a Jedi temple would run into visions and illusions. For Jedi, this was a testing ground. A place where they had to overcome their fears, or could get answers to important questions – as well as gain insight on a variety of issues, theirs or another’s. Non-Force users entering Jedi temples would be disoriented by such visions. I doubt they would survive very long after entering a temple, unless they were good people who had become seriously lost. Or very desperate. A Jedi temple infiltrated by Dark Side Adepts or a Sith would react with extreme prejudice toward them, if not to protect itself, then to protect the Jedi inside it. This is what happened in Shroud of Darkness. One of the reasons the Grand Inquisitor’s spirit was waiting for Kanan in the Lothal temple, I think, is because his ghost would scare the daylights out of Fifth Brother and Seventh Sister. The two Inquisitors had to know they were facing visions which could not really hurt them when the phantom Jedi Sentinels appeared. So the sight of their old master’s ghost – dressed in a ceremonial Temple Guard costume and wielding a Sentinel’s blades – had to have been a shock. It certainly seemed to discombobulate Fifth Brother! That gave the temple the edge it needed to buy Kanan, Ezra, and Ahsoka the time to escape Imperial pursuit. It seems the temple could not really hurt the Inquisitors – it could only stall them. The Grand Inquisitor’s ghost was certainly an effective presence on that account! There is something this writer has to admit here, readers. Seeing the Grand Inquisitor again was a shock for me. No question. But at the same time, it was also a hopeful scene which kind of gave me the warm and fuzzies. It reminded me that we never really know what is in another person’s heart. Kanan and the rest of us assumed the Grand Inquisitor was lost to the Dark Side completely. Then he pops up in the Jedi temple, not as an enemy but as a friend! Who are we to say where someone should or should not be after they die? Who are we to say, upon the death of another person, whether they made it to eternal reward or were sent to eternal punishment? “Consumed by the Dark Side were the Jedi,” Yoda said in Shroud. Depa Billaba, Mace Windu, and other Jedi of the old order probably became one with the Light-side of the Force after Order 66. But it is doubtful that all the Jedi killed in the Purge earned that reward. Some probably fell to the Dark Side before – or at the moment of – their deaths. Just as the Pau’an Grand Inquisitor became one with the Light-side of the Force before – or at the moment of – his death in the reactor core on Tarkin’s ship. Certainly, this is no excuse for going over to the Dark Side in the first place. The remorse-filled expression on the Grand Inquisitor’s face as he tells an astounded Kanan that the other is now an official Jedi Knight says it all. The Pau’an is looking at what he once was when he looks at Kanan. He is seeing a Jedi filled with the light of the Force. And he is remembering how he, who once had the same light in his soul, turned his own back on the Jedi way, walking in darkness in service to the Sith. Until a young man, who only had the training of a Padawan, bested him in a lightsaber duel aboard an Imperial ship. *Sniff. * It really was a beautiful scene, readers. Can we have a round of applause for Rebels’ writers here? *Deep breath. * Okay, on to the rest of the episode! Ahsoka has finally accepted the fact that her beloved master, Anakin Skywalker, became the black-armored terror Darth Vader. But she seems unwilling to give up on him, muttering, “There is still a way,” before racing out of the temple. It is hard not to think that she will try to turn him back to the light. Why in the name of the Force would she not try to do that? We know her attempt will fail. It is Luke who will save his father’s soul, not Ahsoka. Most everyone is saying Tano will bite the bullet in season two’s finale: Twilight of the Apprentice, Part 1 & 2. These episodes will play back-to-back on March 30, and while I agree that the odds are not in Ahsoka’s favor, I am not sure the writers will kill her off in these episodes. They could still get a lot of mileage out of a long, drawn-out conflict over season three between Vader and Ahsoka. That she will die before A New Hope I am sure. Will she die in the season two finale of Star Wars Rebels…? Eh, I am unconvinced. It could happen, though. Of greater concern to me is Ezra’s fate in the season two finale. He is the only other apprentice in Rebels. Kanan just got knighted; he no longer counts as a Padawan. There have been hints that Ezra is skating near the Dark Side throughout the series so far. The first was at Fort Anaxes in season one. And in Shroud of Darkness, it is shown that Ezra has begun to get cocky as his Force abilities have grown. He practically brushes off his and Kanan’s encounter with Fifth Brother and Seventh Sister at the start of the show, kicking back and relaxing as his teacher mulls over the Inquisitors’ apparent power to track them. This probably would have happened to Ezra even if the Jedi Order had not been exterminated. Kids get cocky. It happens. It also means that when they get knocked off their high horses, their first reaction is anger. Ezra is human, and anger is one of our big problems. As a Jedi apprentice, the risks to Ezra’s soul are even greater. 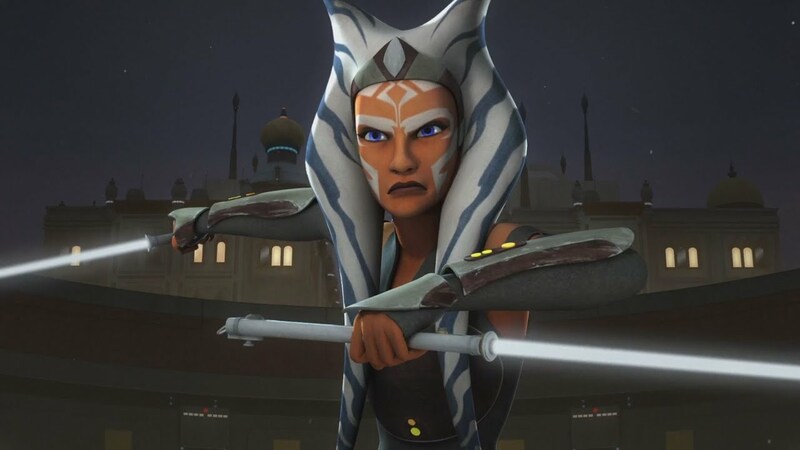 Twilight of the Apprentice may not refer to Ahsoka at all. It may in fact refer to Ezra. The Grand Inquisitor’s statements in Kanan’s vision quest, and the fact that Darth Maul will return in Apprentice, have done nothing to ease my mind about the question. Kanan, while not knowing about Maul, is doubtless worried as well. As the newly minted Jedi Knight pointed out, though, he cannot protect Ezra from everything for all eternity. Ezra has to grow up – and if he falls on his face in the process, well, that is what is going to happen. And it could have the wonderful effect of making him a better Jedi. It could also, of course, have the undesirable effect of driving him toward the Dark Side – and Darth Maul. It is a good thing I have no nails to bite. My fingers would be bleeding otherwise! As for Ahsoka’s inability to help Kanan open the temple on Lothal, it makes sense. She is no longer a Jedi. Though still a Force-user, her blade color – white – marks her as a neutral party/retired Jedi. She is not of the Dark Side, but neither does she serve the light as the Jedi did/do. It would be improper for her to enter a Jedi temple like the one on Lothal without permission – something Kanan apparently knew, as he was unsurprised when Ahsoka told Ezra she could not help open the temple. Finally, readers, I have to say that I am rather fed up with people saying Kanan and Ezra have to die before the time of the original trilogy arrives. Seriously, does no one remember the novels?! Yes, they are no longer canon storylines (thanks so much, Disney/Lucasfilm …grrr). Nevertheless, in these novels there were other Jedi who lived to see the Rebellion arise. Some of these were new Jedi, like Kyle Katarn and Corran Horn. Others were survivors of the Jedi Purge: Quinlan Vos, Ferus Olin, and Kam Solusar. It is true that Ferus Olin died before Return of the Jedi. But, in the books, he did cross paths with Luke and Leia before Vader killed him. Kam Solusar escaped to wild space at the time of the Purge, returning later on – where the resurrected Palpatine caught him and enslaved him. Luke was able to turn him, and Solusar became one of his best Knights in the new Jedi Order afterward. Quinlan Vos, a Jedi whose story was unfinished as of the advent of The Force Awakens and its new timeline (to the best of this writer’s knowledge), may have also lived to run into Luke Skywalker. Kyle Katarn and Corran Horn were both Force-sensitive men who joined the Rebellion at the time of the original trilogy. Katarn joined up somewhere between A New Hope and The Empire Strikes Back, while Corran appeared either between Empire and Return of the Jedi, or after the latter. And then there is Mara Jade, Emperor’s Hand. Her official appearance was five years after Jedi, but books written prior to The Force Awakens showed her running around the galaxy on missions for Palpatine during the original trilogy. Each time, she and Luke almost met, but never quite managed to actually come face-to-face. This strategy of writing kept the timeline of the original trilogy intact, while adding to Mara’s history in the Star Wars Expanded Universe. I do not see why Kanan and Ezra could not have fates similar to Solusar, Vos, Katarn, and Horn. Admittedly there is nothing to prevent them from dying, as Ferus Olin did. In his case, though, he had the same problem Ahsoka does: Ferus knew Anakin Skywalker personally before he became Darth Vader. The writers could not resist ditching him to ensure Luke would never know his heritage before The Empire Strikes Back. Of course, those who think Kanan and Ezra have to die will cite Yoda’s line from Return of the Jedi: “When gone am I, last of the Jedi you will be.” Well, pardon me, but what about the five guys I just listed here? According to these other writers’ logic, Kam Solusar, Kyle Katarn, Corran Horn, and Quinlan Vos should all have died to make Yoda’s statement a hundred percent true. There are reasons why Yoda would say this to Luke. 1) Back when Return of the Jedi was released, there were probably not that many novels focusing on other Force-sensitives in the same time-frame as Luke. This makes Yoda’s statement in the film a hundred percent true. 2) With all the new stories that have come out since Jedi, we need another explanation as to why Yoda would say this. The fact is, Yoda was nine hundred years old, sick, and dying in Return of the Jedi. He died hours after Luke returned to Dagobah to finish his training. Who says that he was still able to see and sense the other Jedi or Light-side Force-sensitives running around the galaxy? I mean, Yoda was strong with the Force, but he was hardly omniscient! It stands to reason he might miss somebody – or several somebodies – fighting for the Rebellion by using the Force as a Jedi would. 3) Solusar and Vos would not have been considered true Jedi by Yoda. Vos married a woman and had a son with her. He was going to leave the Jedi Order once the Clone Wars had ended. Order 66 did that job for him. Solusar, the son of a Jedi Knight who had wed against the Jedi Order’s strict ban, would not have been considered a real Jedi by Yoda either. While I doubt Yoda was a very prejudiced person, the fact is that there would be ample reason for him to consider Kam Solusar a non-Jedi Force-user. Kam became an official Jedi only after training at Luke’s Jedi Academy, anyway. 4) As for Corran and Kyle, who were both Force-sensitive, if I remember correctly they had some guidance from Jedi spirits on how to serve the Light-side of the Force. This was not, however, a substitute for real master-apprentice training, which Obi-Wan and Yoda had given Luke. At best, Yoda would have considered the two men maverick Force-users. They would not have qualified as Jedi in his opinion – though I doubt he thought they were evil. 5) Of course, Ferus Olin was dead by Return of the Jedi in the old canon order of the novels. He Yoda would definitely have considered a Jedi. Even though Ferus pulled an Ahsoka, leaving the Jedi Order after a mishap that ended with the death of another apprentice, he remained a Jedi at heart. Ahsoka did not. This would have been enough for Yoda to consider Ferus – and other stragglers from the Purge like him – as real Jedi. With Ferus and most of the other survivors of Order 66 dead, Yoda would have considered Luke the last of the rightly trained Jedi Knights in the galaxy. I know this makes Yoda sound a little heartless, not to mention senile, mean, and bigoted. But by all the standards of the Old Jedi Order, this is probably what he would have thought. The main reason for this diatribe, readers, is to point out that Kanan and Ezra could very well survive to see the original Star Wars trilogy. 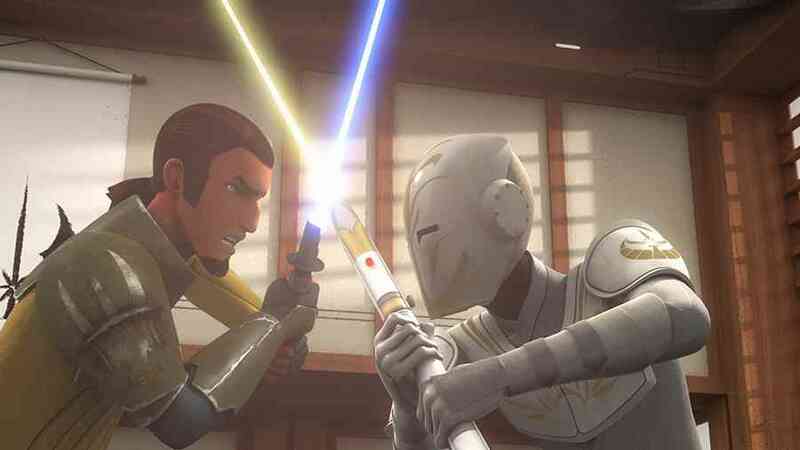 Neither of them have to die – and unless the third season of Rebels will be the series’ last, there is no reason for the writers to kill either of them. Ezra is the main protagonist of Star Wars Rebels. Killing him at the end of the series would be bad taste – killing him in season two’s finale would be a suicidal writing device. Kanan is not much more expendable; at the moment, as Ezra needs a mentor. And, when Ezra finally graduates to Jedi Knight, I still see no reason for the writers to eliminate him or Kanan. Kyle Katarn and Luke Skywalker crossed paths at least a couple of times between the original films in the Expanded Universe novels without interrupting the saga’s timeline. Ezra could do the same thing. Ferus met Luke several times without revealing his true heritage to him. And Ferus knew Anakin was Darth Vader. If Kanan were to cross paths with Luke, I see no reason for him to let the young Jedi in on his heritage – especially since even Ahsoka never figured out that Padmé and Anakin were married. If she could not figure it out, how the heck would Kanan? At most, Kanan could honestly repeat what Obi-Wan told Luke in A New Hope: Anakin Skywalker was a great Jedi Knight and, however improbably (from Kanan’s point of view), he was Luke’s father. That is all Kanan is ever going to know about the subject. Why in the galaxy would Ahsoka ruin his opinion of Anakin by revealing her former master had become Darth Vader? There is no logic there. This is not much protection for Kanan, after a point, but there is even less excuse for the writers to kill Ezra. He is Luke and Leia’s age, born the same day they were. He has been a rebel on the front lines for years longer than either of them by A New Hope. When Return of the Jedi rolled around, he could be on Luke’s short list for recruits for Knights for the new Jedi Order. If Kanan survived the Rebellion as well, then he would be invaluable to Luke as an instructor for the new order of Jedi. The Force Awakens says Luke trained a new generation of Jedi. It never said he didn’t have help doing it. Besides, even if Kanan and Ezra refused to join or help found the new Jedi Order, that hardly means they would have to die. If Disney follows through on a rumor I heard a while ago, they will probably make a TV series based on the new Star Wars film trilogy. Doing that would be a great way to reintroduce us at least to Ezra and Sabine, with flashbacks to Rebels thrown in for good measure. I really see no reason for Kanan or Ezra to bite the dust. That does not protect them being killed – I am simply saying that, from these arguments, it appears foolish to talk about the writers killing them. The people out there spreading rumors of Kanan or Ezra’s demise might want to take their foot off the gas pedal long enough to think things through a little more. This entry was posted in Star Wars Characters and Stories, TV Shows and tagged A New Hope, Ahsoka Tano, Ashley Eckstein, Atlantis: The Lost Empire, Corran Horn, Dark Side, darkness, Darth Maul, Disney TV Shows, eternity, Ezra Bridger, Ferus Olin, Fifth Brother, Frank Oz, Freddie Prinze Jr., Hera Syndulla, Jason Isaacs, Jedi, Kam Solusar, Kanan Jarrus, Kyle Katarn, lightsabers, Matthew Lattner, Pau'an, Quinlan Vos, Return of the Jedi, Sarah Michelle Gellar, Sentinel Jedi, Sentinels, Seventh Sister, Shroud of Darkness, Sith, spoilers, Star Wars, Star Wars Characters and Stories, Star Wars Episode IV: A New Hope, Star Wars Episode V: The Empire Strikes Back, Star Wars Episode VI: Return of the Jedi, Star Wars Episode VII: The Force Awakens, Star Wars Rebels, Star Wars: The Clone Wars, Temple Guard, Temple Guards, The Force, TV series, TV Shows, Twilight of the Apprentice, Vanessa Marshall, visions, Yoda, Zeb on March 3, 2016 by The Mithril Guardian.